We recently changed the domain name of this website from MyWindowsClub.com to Techulator.com, following a domain name dispute by Microsoft. We went through a huge list of tasks associated with the domain name change. One of the concerns we had was how to switch over to a new Feedburner URL that matches the new name of the site. You can see that it contains our old domain name. Even though technically it is not a problem, we thought it is more appropriate to change it to the name that match our new domain name. However, I was concerned about the impact of changing the Feedburner feed URL and what will happen to our existing subscribers if we rename the Feedburner URL address. 2. Lose the links from various feed directories, RSS search engines and other feed services. How to change or rename Feedburner URL? You can edit the feed name and change it to new name in the Feedburner control panel by clicking on the link "Edit Feed Details". This will simply rename your feed to any other available feed address of your choice. You will not lose any of your subscribers. All existing settings and subscribers will remain and the only change will be the feed url. You will have to update any links in your website or other places where you have placed links or email subscription forms to your feeds. Option 2: Delete old feed and create new one. This is not a recommended practice since you will lose all existing subscribers and all settings as well. You need to start from scratch and re do all settings and configuration. Also, you will have to update all links in your websites and point to the new Feedburner feed url. Option 3: Create a new feed and delete old feed, with redirect to new feed. - Delete the old feed which you just updated. 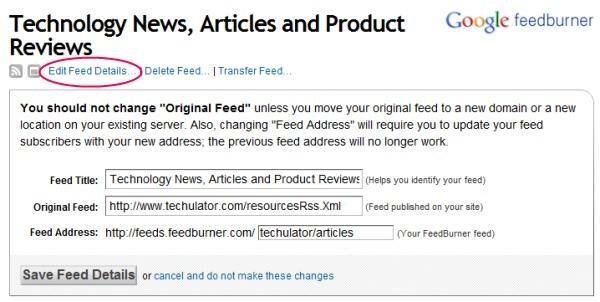 When you delete the old feed, Feedburner will automatically redirect the traffic to the source feed (which is the new feed you just created) for 15 days, with a 301 redirect. So most automated systems and search engines will stop using the old feed and switch to the new one. In the next 15 days after the first 15 days, people who access the deleted feed will get a single item in the feeds that says "This feed is no longer active. A new feed is located at <new feed address>"
After the 30 day period, the deleted feed will be permanently removed giving an HTTP 404 error. It is important to note that the 15 days redirect period is too short for most subscribers to get notified and switch over to your new feed. Also, many subscribers may not bother to switch themselves to the new feed. In this approach, you rename your old Feedburner feed to a new name. This will preserve all existing subscribers. Then create a new feed with the old name and same settings. This will make sure the blog directories, feed search engines and other websites that link to your old feed will not have a broken link. Then take your own time to contact all blog directories and webmasters to update their feeds to the new name. What is the best way to change Feedburner URL? Weighing the options, I prefer the option 4 where I simply rename the feed address in the Feedburner to a new name and then create a new feed with old name. With this option, you will not lose any of your feed subscribers and settings. Also, you will not lose the links from other blog directories, feed search engines and websites. Other webmasters will not get mad with broken links. Once you are settled with your domain name change issues, you can contact all webmasters and request for a change of feed link to your new feed address. Do you agree with the option I suggested above? Please feel free to share your comments and feedback below as a response. I would like to discuss the pros and cons and also like to hear different views from others. Looking for information on the domain dispute between Microsoft and SpiderWorks Technologies on the domain name MyWindowsClub.com? Read the current status of our domain dispute with Microsoft. This is exactly what we are looking for. We're re-branding with a new name and URL, but keeping all our old content and want to keep our subscribers. The only piece that I'm missing is clearly a newbie question: Where do I find a list of blog directories and webmasters to update? Are these the sites that sometimes show up in my list of "uncommon uses"? Instead of search for all available blog directories, go to your analytic and find the sites that re linking to you. And then contact those webmasters and request them to update your link. There is no guarantee that everyone will respond to you. This wasn't very clear for a non-techy person, such as myself, to understand. Did you just type your new URL into the 2nd box that says, "original feed"? Also, I wouldn't even know where to begin to contact a webmaster? You have to remember that people who need this information don't know anything about this stuff. More specific details would be appreciated. Thank you!